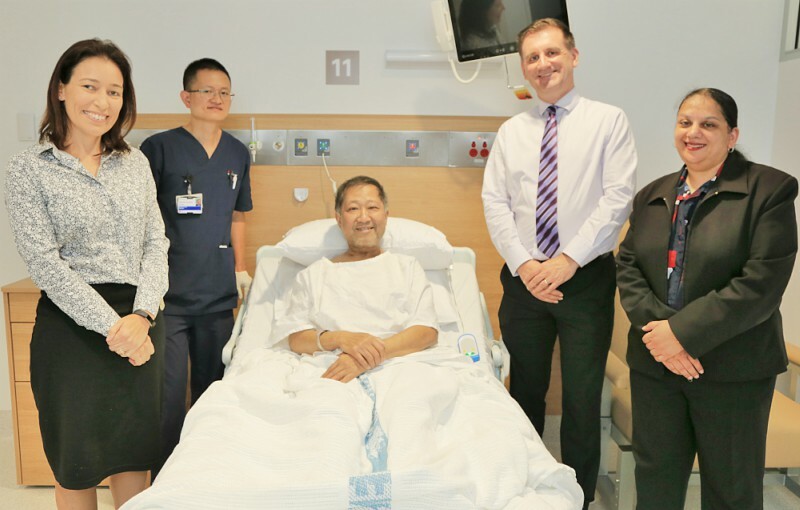 Westmead Hospital director of nursing Kate Hackett, nurse Luke Huang, first new-look gastroenterology ward patient Peter Wong, Westmead Hospital general manager Andrew Newton and Westmead Redevelopment executive director Leena Singh. Westmead Hospital’s new-look gastroenterology ward has welcomed its first patients today (11 October 2017), following an extensive refurbishment. The new 16-bed ward is part of the Westmead Redevelopment, the state’s biggest health infrastructure project. Bella Vista resident Peter Wong was the first patient admitted to the new ward and said it was great to receive treatment in a fresh, modern space. “It’s beautiful and the room sizes are amazing; it just looks very flash,” he said. The new ward includes larger treatment and patient rooms, along with a new negative pressure isolation room for immunocompromised and infectious patients. A new procedure room has also been installed for transnasal endoscopy and FibroScan procedures. Transnasal endoscopies identify upper gastrointestinal bleeding while FibroScans measure liver stiffness for signs of cirrhosis and fatty liver. Westmead Hospital gastroenterology head Professor Jacob George said the new ward was the first step in a major refurbishment of gastroenterology services at the hospital. “We’ve really looked at the best way for patients to flow through the ward – from reception to the bedside and bathroom, right through to treatment and discharge areas,” he said. Westmead Hospital general manager Andrew Newton said the refurbishment would enhance the efforts of the hard-working gastroenterology team. “The new environment is fantastic but the gastro team’s commitment to our patients will make this space truly come alive; I like to think our staff are the mortar for the new bricks,” he said. The Westmead Redevelopment includes a new central acute services building, along with the refurbishment of more than 30 per cent of Westmead Hospital. The project is expected to be completed by 2022.